Can Technology Improve Natural Gas Pipeline Safety? The natural gas pipeline explosion in San Bruno California is a tragic accident no one wants to see repeated. Recently Pacific Gas & Electric reported to the California Public Utility Commission that it found a dangerous leak on a Contra Costa County gas distribution line that has never been surveyed even though such inspections are required every five years. There are two reasons this issue is important to me. First, for five years I ran the natural gas pipeline safety inspection program in my role as Public Utility Division manager at the Illinois Commerce Commission. I have seen my share of pipeline safety problems but thankfully nothing like San Bruno happened on my watch. Most natural gas pipeline safety problems result from corrosion in the metal pipes and from the lack of regular inspection and maintenance. The good news is most pipeline safety accidents can be prevented but it requires diligence. The job of every pipeline safety inspection program is to assure that the utilities are performing that diligent inspection of their pipelines and addressing the leaks and corrosion issues discovered promptly. The second reason this issue is important for me is that PG&E is MY natural gas utility provider and I live in Contra Costa county not too far from the pipeline never inspected. The leaks PG&E discovered could have caused substantial property damage or injured people. They were found in a Pittsburg, California gas distribution line that was part of almost 14 miles of pipeline that were “overlooked” in surveys that are required every five years. The Pittsburg leak was categorized a “grade 1” leak meaning it represents a clear hazard to persons or property. That leak has been repaired. A total of 22 leaks were found in Contra Costa County communities of Brentwood, Byron, Concord, Danville (my home town), Discovery Bay and Pittsburg. The lines had never been inspected because the 16 large maps covering them had been left out of a leak survey schedule that is required every five years. This is the kind of preventable error that is giving PG&E a ‘black eye’ at the CPUC and from its customers—-‘how could this happen’ being the question most asked? The answer is it happens more times that we know because much of the historical record of the natural gas pipeline system was paper maps and records and its care and maintenance is in the hands and heads of experienced pipeline maintenance and operations crews now rapidly reaching retirement age. The answer to problems like this can also be found in technology. I am a partner in Tech & Creative Labs a Boston-based collaboration of software and technology companies working together to extend the reach of their product capabilities to serve new business needs in the energy vertical. As I discussed this pipeline safety issue with my colleagues we realized that we had technologies that could be re-purposed to help companies like PG&E address this problem and regain full control over their pipeline operations and its safe and reliable maintenance, repair and regulatory compliance. social collaboration and learning solution that brings it all together to make it fast, easy to use and effective. FIELD DATA GATHERING, SYNCHING SOFTWARE FROM THE ALBERTA OIL PATCH. Up in the cold remote oil and gas fields of Alberta the well operators need access to data about the well they come to inspect. But there is no phone service or interest access. So HOT BUTTON SOLUTIONS created a simple, elegant software solution that load well data on a memory card inserted in a rugged remote handheld device for use by the field crews to gain access to the well data. The field crews inspect each well and take temperature and pressure reading as well as notes about any problems or anomalies they find in their inspection. They enter that data on the handheld device and take it back to the office with them when their work is finished. Each handheld device memory card is downloaded and its data “synched” so that updated information it is ready for the next crew to take into the field. Simple, easy, rugged and reliable. But the Hot Button synching software does much more than integrate the data. It matches each field crew members assigned inspection tasks with the data reported to VERIFY the inspections were done. It compares the latest readings with the historical performance of each pump, motor and other piece of equipment to identify anomalies. Temperatures or pressures out of normal operating range indicate mechanical or equipment problems that need attention. It documents the inspection process, findings and follow-up actions. Now imagine if PG&E had this same simple system in place for its natural gas pipeline distribution system. The work flow would allocate the pipeline segments for routine survey, inspection, maintenance and reporting to crew members. It would specify the temperatures, pressures, pumps and motors, values and other appurtenances that are to be inspected. That handheld device issues to each PG&E crew member would give him access to every data element PG&E has for each segment of the pipeline. The system is the solution in this case. Fourteen miles of pipeline do not go missing and unsurveyed when someone is assigned to inspect it and the software used to produce compliance reports on pipeline safety inspection to the California Public Utility Commission is the SAME solution used to track, inspect and audit the system or the software alerts you —hey what about those 14 miles of gas pipeline in the East Bay? DATA VISUALIZATION SOFTWARE FROM MANUFACTURING AND FINANCIAL SERVICES. The data for a complex network like a natural gas distribution system consists of thousands of records. While data gathering and synching solutions can keep a database accurate and up to date that does not mean the data it contains can be turned into useful information or insight for field crews, gas system operators, utility managers or regulators. Data overload is a big problem in every organization and one of the best ways to deal with it is technology that improves our ability to visualize the data and put it to work. One of our partner companies is PANOPTICON a leading provider of data visualization software tools to help Fortune 1000 companies speed up their business processes, reduce operational and investment risks, detect anomalies (including fraud), and identify opportunities to increase profits and sales. Panopticon’s customers include 5 out of the top 10 largest banks and fund operators in the world, plus several of the largest industrial manufacturers, Consumer Packaged Goods (CPG) producers, architecture & engineering firms, energy companies, and telecommunications firms. 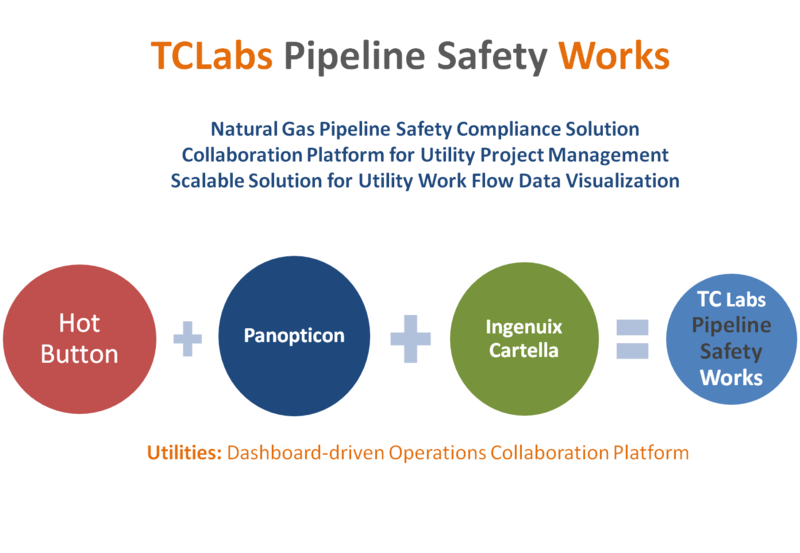 Adding Panopticon’s data dashboards and visualization tools to the Hot Button data gathering and synching solutions creates a fast, easy, commercially available solution for doing exactly what PG&E and every other natural gas pipeline operator needs to do today. COLLABORATION AND LEARNING SOFTWARE IMPROVES TEAMWORK AND COMMUNICATIONS. Gathering data and organizing it is important to every natural gas pipeline safety solution but putting that data to work to support field crews today and train the next generation of workers across your organization is the sine non qua of safe reliable operation. Social software is going mainstream and one of our partner companies provides an extranet collaboration solution called Ingeniux CARTELLA that is fast, easy to use and full of the features and functionality that puts gas pipeline safety data in the hands of field crew, engineers, inspectors and managers in ways we have not seen before. Collaboration software is the perfect vehicle for giving employees access to best practices, work methods, and expertise to deal with any pipeline safety issue. Why is this important? Because for PG&E and many other organizations the baby boomers are retiring at an increasing rate and a critical transition strategy for gathering and transferring the knowledge and experience of existing pipeline crews and other employees is collaboration-driven learning solutions to speed that knowledge transfer. Tech & Creative Labs is building solutions to complex business problems like this every day by putting to good use existing technologies actively working in other industries to solve the pressing business needs in our changing energy vertical. This entry was posted in Product Strategy and tagged Contra Costa County California, Illinois Commerce Commission, natural gas, Pacific Gas & Electric Company, Pittsburg, Public utility, San Bruno, San Bruno California. Bookmark the permalink.